Before you start reading today's blog post at the Complaint Department, I have some great news to tell you: I am in today's San Francisco Examiner about the addition of service on Muni's 38L-Geary Limited to fill-in the 2.5 hour gap. You can read the article here or get today's print edition and look at page five. Hooray! This is something I've been waiting for a long time, Muni and Nextbus are putting up stop ID numbers at stops where the electronic signage is not installed. I first noticed these in my neighborhood at the 18-46th Avenue bus stops where there's no waiting shelter. 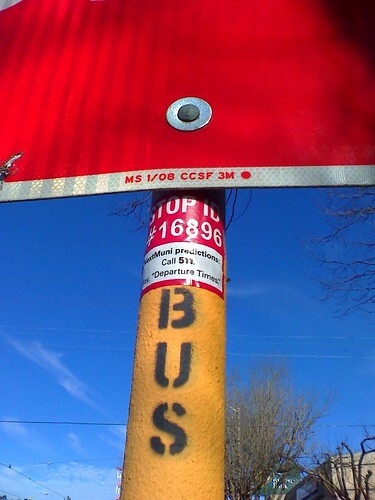 The stickers were big and put on the poles painted in yellow saying "BUS STOP." The stickers are spreading around the city; the one photographed is on 14th Avenue & West Portal for the 17-Parkmerced stop. If you ever wanted to find out when your next bus or train was to arrive, but you are not at a bus shelter with the electronic signage installed, calling 511's voice automated system was a little challenging if you didn't know the "stop ID number." The system would ask you for the transit agency's name, bus/train line, direction (inbound or outbound), and location of the stop. Sometimes, the system would not recognize the route you requested, especially the K/T lines and the Powell/Mason/Hyde Cable Cars. But fear no more SF citizens! We just tell 511 the digits and that's it! I can't afford an iPhone, so I rely on 511 to provide me the information. Message: "nextmuni (and the bus ID #)" For example: "nextmuni 16896"
The stickers should include a QR Code linking to the stop's specific nextbus page. Then anyone with a smartphone can easily bring up the page.